Schedule reliable water services in Chandler, Evansville, Newburgh, IN and the surrounding areas! Are you content with the quality of the water in your home or office? You don't have to sip on water that has an odd taste or smell. Culligan of Evansville provides an array of water services in Chandler, Evansville, Newburgh, IN and the surrounding areas to make sure you have fresh, clean water whenever you want it. You can have clean water in your home or office in no time. Call 812-853-5000 today to learn more about our water services in Chandler, Evansville, Newburgh, IN and the surrounding areas. 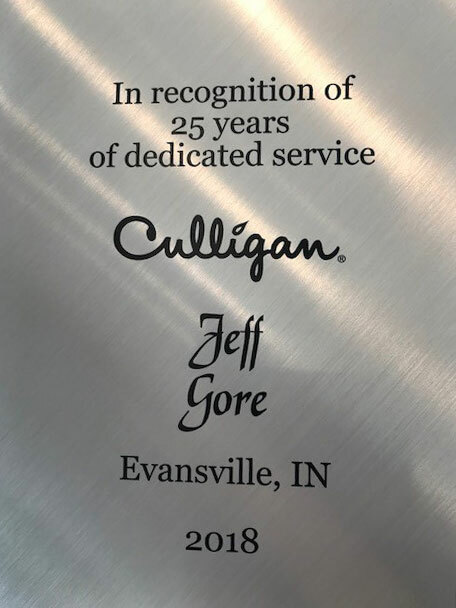 Congratulations to our Owner, Jeff Gore, for his recent 25 years of dedicated service award! Find Out How Culligan Can Help Improve Your Family's Drinking Water! You use water on a daily basis for cooking, cleaning, washing and drinking. It's important to be able to trust the quality of what you're putting into your body, home or office. You can rest easy knowing that harmful elements and chemicals aren't in your water supply by having it tested. Speak with a professional at Culligan of Evansville today to schedule water testing services in Chandler, Evansville, Newburgh, IN and the surrounding areas. Culligan of Evansville is a locally and family-owned business in Chandler & Evansville, Indiana. We've been serving the area since 1958, and take pride in providing outstanding customer service. Our goal is for every sip of water you take to be clean and refreshing. Contact us when you need water services in the Evansville area, including Indiana, Kentucky and Illinois. Indiana: Evansville, Mt Vernon, New Harmony, Poseyville, Princeton, Oakland City, Boonville, Chandler, Newburgh, Rockport, Chrisney, Santa Claus, Grandview. Copyright © 2019 Culligan of Evansville, all rights reserved.